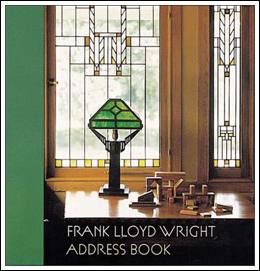 You’ll always have the Wright address with this beautiful deluxe address book. Forty full color photos of Wright’s buildings and interiors create the perfect environment to house the names, addresses, phone numbers and emails of 480 of your closest friends and family. The 7” X 8” book, with its hard cover and hidden spiral binding, make it a beautiful gift for yourself or someone else. Isn’t it time to replace that old worn out thing you’ve been holding together with rubber bands?